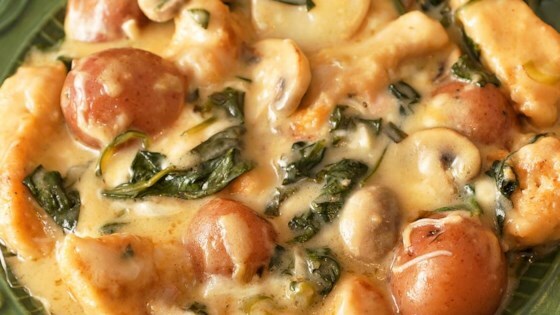 "If you are looking for a creamy, cheesy, flavorful recipe - this is it! Comfort food is always welcomed in every home. I think most of you will love this dish!" Preheat the oven to 350 degrees F (175 degrees C). Oil a baking dish. Combine flour, garlic powder, onion powder, paprika, poultry seasoning, salt, and black pepper in a large resealable plastic bag. Add chicken and toss to coat well. Shake off excess breading. Heat olive oil in a skillet over medium-high heat. Brown chicken on both sides, 5 to 10 minutes. Transfer to the prepared baking dish. Cook and stir potatoes in the same skillet until almost tender, 3 to 5 minutes. Transfer to the baking dish. Add butter to the same skillet over medium-high heat. Saute mushrooms for 2 minutes. Add green onions and garlic and saute until garlic is browned, about 3 minutes. Add soup, broth, and sherry. Bring to a boil and cook until sauce thickens, about 5 minutes. Add spinach and cook until wilted, 2 to 3 minutes. Pour sauce over chicken and potatoes in the baking dish. Top with mozzarella and Parmesan cheeses. Cover dish with aluminum foil. Bake in the preheated oven for 20 minutes. Remove aluminum foil and bake for 20 minutes more. Breaded chicken breasts are baked with mushrooms and melty mozzarella. Use cream of mushroom soup if preferred. You can use any wine instead of sherry. Substitute any cheese you like for the mozzarella. This recipe was a lot of work for the subtle flavor it had. I will not be making it again. This recipe sounds like it will taste great! Thanks for this recipe! This was delicious. I modified the recipe to be gluten free and everyone loved it.